The authorities in New Delhi scrambled to put in place emergency measures, including shutting down schools and warning citizens against taking their daily walks after the Indian capital continued to be blanketed in smog yesterday. Delhi's deputy chief minister Manish Sisodia, in a tweet yesterday, said: "Due to the deteriorating air quality in Delhi, the health of children cannot be compromised. We have ordered the closure of all schools in Delhi until Sunday." On Tuesday, Mr Sisodia urged people to avoid their morning walks. "The situation is close to a severe crisis," he said. The Delhi government yesterday planned to discuss reviving the "odd and even car plan", which means people will be able to drive their cars only on alternate days. Under the plan, cars with licence plates ending in an even number will be allowed on the roads on even-numbered dates, and cars with licence plates ending in an odd number can be used on odd-numbered dates. The government also advised children and the elderly to avoid going outdoors as far as possible as the air quality reached critical levels for the second day in a row. The website of the United States Embassy in India publishes an air quality index that measures the concentration of fine particulate matter in the air. The index exceeded 600 in several parts of the city yesterday morning. 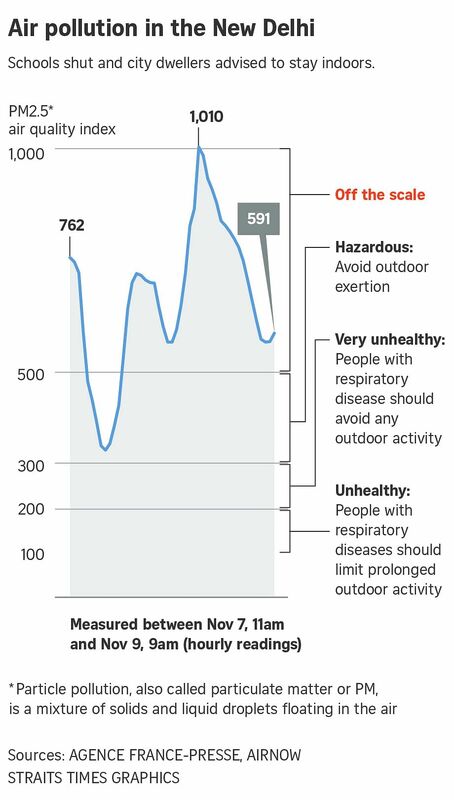 If the air quality goes beyond 300, the index considers it hazardous, and advises that people should avoid any exertion during outdoor activities. The current spike in pollution is being blamed on the burning of crop stubble combined with the onset of winter. Falling temperatures trap pollutants in the atmosphere, while windless days and nights mean pollutants settle over the city and surrounding areas. The Supreme Court-appointed Environment Pollution and Control Authority has urged the Delhi government to quadruple parking fees and reduce metro fares to encourage commuters to use public transport, the Delhi-based Centre for Science and Environment (CSE) said. There were also reports of trains and flights being delayed in the capital yesterday due to poor visibility. The Indian Medical Association declared a health emergency, and has called for a half marathon on Nov 19 to be cancelled to protect the health of runners and volunteers. Delhi, with a population of more than 16 million people, is one of the most polluted cities in the world. The problem has become a serious one over the past decade, with no signs of abating. Pollution has increased due to rapid vehicle growth, a preference for diesel cars, increased construction activity in and around Delhi, and the burning of leftover crop stems or stubble by farmers in the neighbouring states of Haryana and Punjab. Experts said it is time for Delhi to make tough decisions. CSE executive director Anumita Roychowdhury said: " It is a choice the city has to make. How aggressive can you get? It means shutting down construction activity and bringing in odd and even days for cars. The action now being taken is to prevent further peaking of pollution... It will not make pollution go away." People took to social media yesterday to express their frustrations. Former Aam Aadmi Party leader Kapil Mishra, in a Twitter post yesterday, said: "As a father of a six-year-old daughter in Delhi, I demand that my chief minister face the media today, the health minister face questions & environment minister tell us what's their plan." Medical experts have said the pollution is so harmful in some parts of the city that it is similar to smoking 50 cigarettes a day.